Instagram has revolutionized the beauty industry in countless ways, including how we see ourselves through our selfies. While the app’s filters may spice up your online life with playful additions such as floral crowns, rays of sunshine or, my favourite, some tongue-in-cheek bunny ears, they also do things such as give the illusion of enlarged eyes, sharp cheekbones, an even skin tone and plump lips. Now, makeup brands are developing products specifically to replicate these filters. This trend isn’t about hiding flaws or recreating someone else’s version of perfection, but enhancing your look in a tech-savvy way. “I wanted to take all of the positive elements of how you look and feel with a social-media filter – that feature-enhancing, share-inducing, confidence-boosting love mentality – and turn it right into reality for every woman,” London-based makeup artist to the stars Charlotte Tilbury says of her new Instagram-inspired collection. Called Beauty Filters, it includes four products designed to give eyes, cheekbones and lips that filtered enhancement (Tilbury’s Instagram favourite is the rainbow filter, by the way). Take the Bigger Brighter Eyes palettes, which are carefully designed to enhance eyes. “Inspired by those sparkling, eye-widening filters of social media, I have colour-curated and coded the palettes using those gorgeous universal reddy tones which naturally colour contrast and brighten the appearance of the iris to make the eyes look instantly bigger and brighter,” says Tilbury, adding that she’s demystified the application process into four steps: prime, enlarge, define and pop. “It’s what I call putting the ‘lights-into-the-eyes.’” No word on a hair product that adds the look of rabbit ears to your locks just yet. Each shadow is colour-formulated to give the optical illusion of widening and brightening. Charlotte Tilbury Bigger Brighter Eyes, $66 at Holt Renfrew and Nordsrom (charlottertilbury.com). When RuPaul-sized falsies are too over the top, these synthetic silk lashes mimic the natural-looking effect of professional extensions. 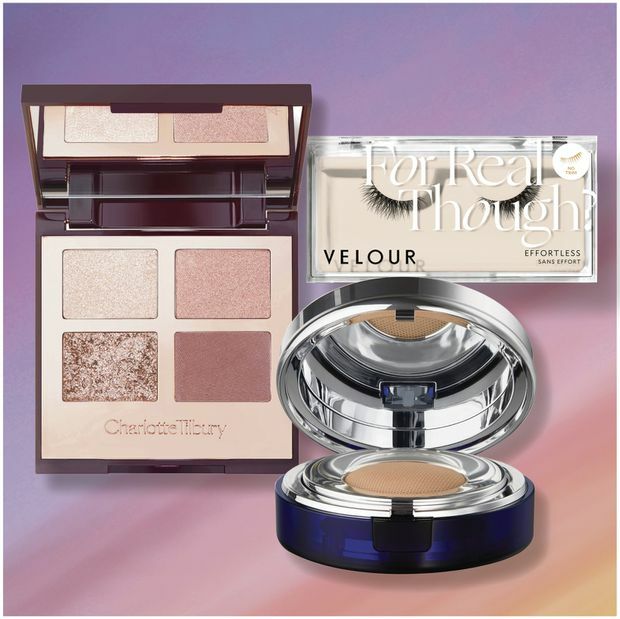 Velour The Effortless Collection For Real Though?, $34 at Sephora and through velourlashes.com. Because there’s more to a photo-ready finish than what’s on the surface, La Prairie’s first cushion foundation is infused with caviar water to hydrate your complexion. La Prairie Skin Caviar Essence-In-Foundation, $255 at Holt Renfrew and Nordstrom (laprairie.com).